Funeral services will begin on Saturday, at 9:15 am from the Edward J. Chomko Funeral Home & Cremation Services, 262 Railroad Avenue, West Scranton with Mass of Christian Burial to be celebrated at 10 am by the Rev. Richard Fox, Pastor, in St. Patrick’s Church. Interment will follow in Cathedral Cemetery. Viewing for family and friends will be on Friday, 4 to 7 pm in the funeral home. Roseann Shaughnessy, 76, of West Scranton, died suddenly on Tuesday after being stricken ill at home. She was the widow of John F. “Jack” Shaughnessy who died on January 26, 1999. Born in Scranton on July 10, 1941, she is the daughter of the late John and Ann O’Donnell Regan. A 1959 graduate of West Scranton High School, Roseann was a member of St. Patrick’s Church and was a Para Professional at NEIU and retired after more than 40 years. Roseann was a loving wife, mother, grandmother and sister who enjoyed working with the special needs of her students at NEIU and was very close to her colleagues at work and maintained a close friendship with them throughout her life. Roseann was extremely proud of having grown up in the Bellevue section of West Scranton. She loved the time spent with her family and especially her grandchildren and was famous for her open door policy for all of the holidays, especially for Christmas Eve. 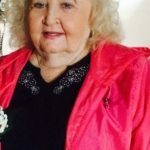 She is survived by five sons, John F., Florida, Patrick and wife Barbara Courtwright, Virginia, Joseph and wife, Belinda, Taylor, Brian and wife Desiree, Scranton, and Kevin, Scranton. Seven grandchildren, Kasey, Brianna, Katelyn, Kelsey, Taylor, Sean and Peyton Shaughnessy. One sister, Mary Regan Occulto (who was her best friend) and husband Joseph, Dunmore, two brothers, Jack Regan and wife Mary, Delaware and William Regan, Scranton. Funeral services will begin on Saturday, at 9:15 am from the Edward J. Chomko Funeral Home & Cremation Services, 262 Railroad Avenue, West Scranton with Mass of Christian Burial to be celebrated at 10 am by the Rev. Richard Fox, Pastor, in St. Patrick’s Church. Interment will follow in Cathedral Cemetery. Viewing for family and friends will be on Friday, 4 to 7 pm in the funeral home.